Loyola Marymount basketball player Enoch Simmons tried out a new sport in summer 1987 and he was pleased with how it turned out, according to The Los Angeles Times. That sport was baseball and it gave him something to think about the next summer after being drafted by the Athletics. "I did well, and I realized how much potential I had," Simmons told The Times. "It was a confidence builder. . . . I think if I'm out there 10 months, 12 months of the year, I'll be much better because I'll be consistent." 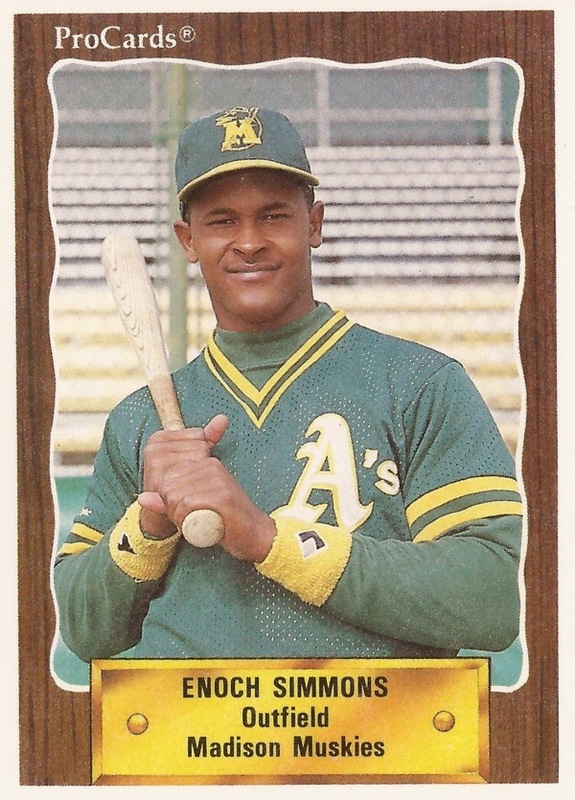 Simmons eventually did choose his new sport and he went on to a pro career that spanned seven seasons. He made AAA, but not the majors. Simmons' career began that year in 1988, taken by the Athletics in the fourth round of the draft out of Loyola. Playing for the basketball team in February 1986, Simmons was credited with the three-point play that gave the team a win over Portland. He played in a total of 116 games for the Lions, scoring 1,379 career points, 14th all-time at the school. With the Athletics, Simmons started in the rookie Arizona League. He hit .307 in 45 games. He also suffered a broken nose in an on-field brawl, according to The Times. He returned to the basketball team after the season to finish out his eligibility. "I'd regret it if I missed my last chance," Simmons told The Times that November. "I feel more relaxed about basketball this year. Now I don't feel like I'm missing something (baseball). I feel I'm playing a lot better because of that." Simmons spent his second season between single-A Modesto and short-season Southern Oregon. In 71 games, he hit .218. He went 2 for 4 with a double in a July game for Southern Oregon. The outfielder moved to Madison for 1990, but his average sunk further. He got into 117 games, but hit just .184 with three home runs. He returned to Modesto for all of 1991, then hit high-A Reno in 1992. He hit .260 at Reno. He split 1993 between three levels, including his first 43 games at AA at Huntsville. He got into 75 games between Huntsville and AAA Tacoma in 1994. He knocked a two-run double in a June Tacoma win. He hit .239 overall. It was his final season as a pro.